A proposal by the labor ministry to raise the retirement age in Vietnam has been met with a mixed public reaction. The Ministry of Labor, War Invalids and Social Affairs recently published a draft of its revised Labor Code which called for the legal retirement age to be raised from 55 to 60 for females and 60 to 62 for males. Amidst public backlash, the ministry justified the move as a countermeasure to Vietnam’s aging population, a demographic which is threatening to empty the coffers of the state social insurance fund. According to the Vietnam Social Insurance (VSA), in reality, the average retirement age is about three years lower than the age stipulated by law, a situation seemingly encouraged by current policies that allow a full pension for male and female retirees who have bought social insurance for 30 and 25 years, respectively. This policy means that, supposing a public worker starts their job at the age of 25, they can retire five years early and still receive a full monthly pension equivalent to 75 percent of their monthly salary while on the job. The VSA argues that this policy discourages workers from contributing to the social insurance fund until the legal retirement age and puts extra pressure on the fund to cover early retirees. The government-run body also cited increased life expectancy and gender inequality as an explanation for narrowing the gap in the retirement ages of male and female workers to two years. 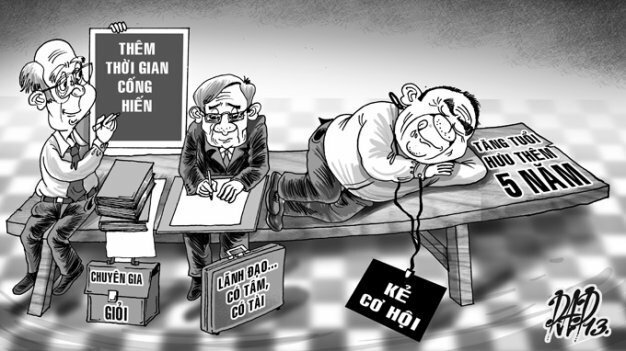 Le Dinh Quang, deputy director of the Labor Relations Department at the Vietnam General Confederation of Labor (VGCL), agreed with the proposal, saying a raise in retirement age follows a global trend to make the best use of experienced and capable personnel, especially in science and technology. Critics of the age raise seem to disagree with Quang’s line of logic, saying the root of the problem does not lie in the retirement age but in current social insurance policy loopholes. Dang Nhu Loi, former vice chairman of the National Assembly Committee on Social Affairs, suggested adjustments to these policies to calculate a retiree’s pension depending on the length of their participation in the national social insurance program. According to Loi, the topic of raising the retirement age in Vietnam has been brought up before, but has unfailingly been opposed by the majority of laborers who would rather not work longer than required by law. Meanwhile, despite approving the idea of a raise, Le Dinh Quang disagrees with how the revised Labor Code puts all male and female workers into only two categories based solely on their gender. He says many other factors should be included in determining an individual’s legal retirement age. Lawyer Dinh Cong Vinh from the Ho Chi Minh City Bar Association added that the responsibility to administrate the social insurance fund so that it does not run out of money lies with the government and that workers should not be made to carry the burden. According to a survey conducted between 2007 and 2012, Vietnam has around 100,000 new retirees each year, the average age of whom is 53.2 years (55.1 years for men and 51.6 years for women). Among these, 0.1 percent retire between ages 35 and 40; nearly 30.5 percent retire between 41 and 50; over 68 percent retire between 51 and 60; and 1.4 percent retire at the age of over 60. The average Vietnamese life expectancy is 73.2 years.